Standing letterboard spells out your messages in hotels, conference centers, halls and community centers, professional offices and more. 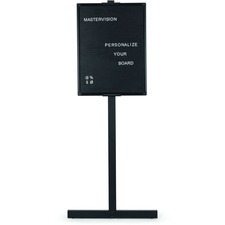 The portrait, 18"" x 24"" board provides a grooved message surface where you can securely fit pin-style plastic characters (sold separately) for a clean, easy-to-read message. Easy-to-use precision grooves accommodate 3/4"" or 1"" letters. Sturdy black aluminum frame features stylish polymer black and silver corners. Heavy-duty steel stand is 21"" deep and 54"" high with board. Letterboard includes mounting hardware.